Exciting Robots in Disguise with Autobots, Predacons, and Decepticons from the HUB TV series Transformers Prime! Transform from vehicle or creature to roughly 6-inch robot and back again! "Freedom is the right of all sentient beings"... and toys are the right of all Earthlings! Direct from Hasbro comes this exciting batch of heroes and villains from Transformers Prime. 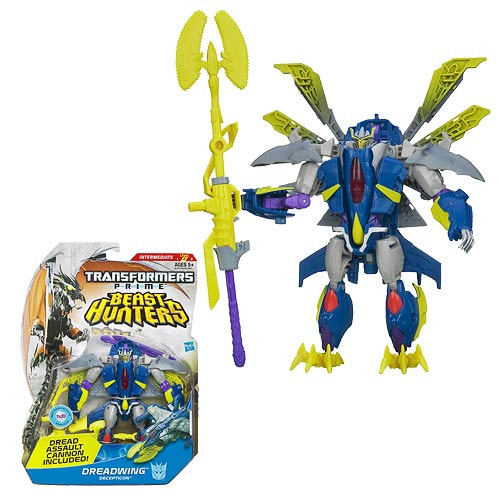 Transformers Prime Beast Hunter Deluxe Dreadwing has firing rockets and an axe, plus he's ready to fight the Autobots... and maybe a few Predacons! Ages 5 and up.